Great home for large family or multiple families. Warm and cozy just minutes from the slopes. Enter into spacious living room with wood burning fireplace (plenty of wood provided). Dining area with large table opens to kitchen. Washer and dryer are on this floor for your convenience. Upper Level has two bedrooms (one full and one with two twins) and hall bath and a large master bedroom (queen bed) and master bath. Lower level has three bedrooms (one queen, one full and oversized bunk room - 2 bunk beds - with TV, video games and cable) and a hall bath. Charming and comfortable in a great location. Please contact us at (914) 263-1346 before you make the quote to see if the property is available for the period requested !!! This is a very convenient location to Stratton mountain. It’s under 2 miles to the drop off/pick up line at the mountain. Aside from the master, the bedrooms are a bit small but they were all cozy with nice linens. 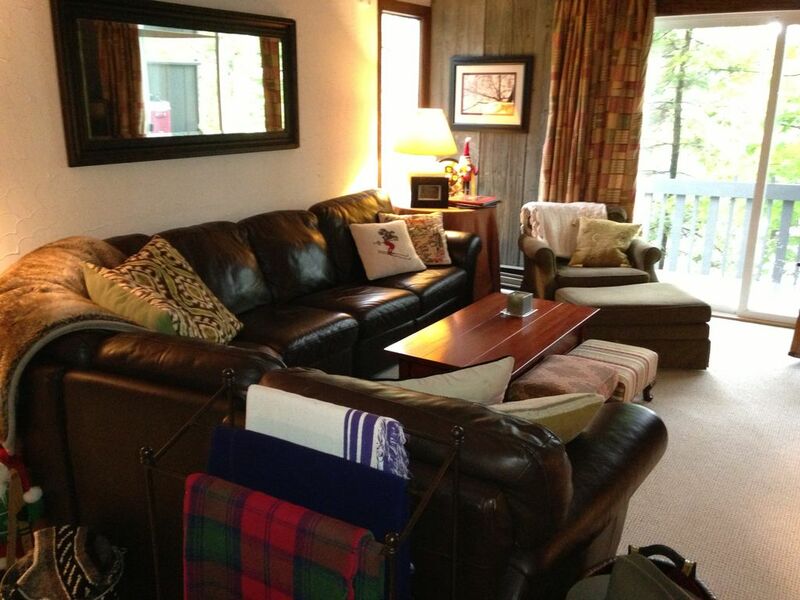 There is a large family room with plenty of seating and a nice fireplace. The kitchen was stocked with plenty of pans and serving pieces. There weren’t many overhead lights in the house so it did feel a bit dark but it wouldn’t deter me from renting again by any means. The owner was lovely and very responsive. Cozy townhouse with ample sleeping space. Nice cozy town house right on Stratton mtn access road Comfortable upstairs family room w a big couch and a nice fireplace. Owner was very responsive to questions and everything was in good working order. We had 10 guests and there was plenty of rooms for sleeping. Very good experience. Thank you to the Johnston's for allowing our group to stay at the house for the long weekend. It was a wonderful experience, the hosts were easy to get a hold of and answered all of our questions. The house easily fits 12 ( and could easily fit 14) with three levels and a huge living room space. Stratton is a 5 minute drive from the house- very convenient. Stocked with everything you need- we really enjoyed our stay. Close to Stratton, Bromley and Mount Snow. Good days of skiing! This house is in a great location for Stratton (just a couple miles down the access road) and perfect for a big group. There are 4 bedrooms with queen or double beds, another bedroom with two twins, and another room with 4 bunked beds. The living room has a great fire place with wood provided, and an open kitchen perfect for hanging out. Thanks - we had a great time!